Last week I covered the description of the frame and seat, and said at the end of the story that I was about to start some serious testing. So what did that testing involve – and what were the results? Since Chalky’s major purpose in life is to be a touring machine, the first major testing was to load up the beast. 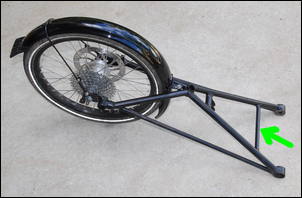 Not having yet built the rear carrier, I used the pictured one from my Air 150 recumbent trike - this fitted straight on. I then attached two Arkel RT40 panniers and loaded them and the carrier with no less than 43kg of water, contained in plastic bladders and a plastic container. (Why water? Water is heavy – 1kg per litre - and is an easily handled load.) The load of 43kg is a LOT – I expect my normal touring load to be under 30kg, so 43kg represents a 30 per cent overload. The test course was out of my workshop onto the front yard (a 60mm step), across the bumpy yard and then around the bitumen cul de sac on which I live, running at times onto the bumpy dirt verge. 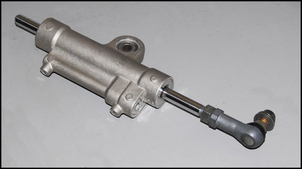 But I didn’t get as far as the bitumen – an ugly sound occurred from underneath and I found that the front of the rear suspension arm had spread a little, allowing one of the two bearing carriers to pop off the bearing. I added a brace to tie the front of the rear suspension space-frame together, then went testing again, still with the 43kg extra load. This time all seemed fine over the bumps. Throwing the machine around (two wheeling, full steering lock at speed, hard braking) showed that the extra ‘touring’ weight was located higher than desirable: the trike rolled a fair bit and, moreover, could be provoked into lurching with the weight transfer. Clearly, the borrowed carrier was positioning the loads higher than they needed to be, so building the correct carrier became a priority. However, how would the machine handle at speed, even with the loads mounted so high? I rode some local roads – very steep and bumpy bitumen. At speed over long wavelength, low amplitude bumps, the trike could develop a corkscrewing motion – the lack of roll damping, and the lack of front suspension damping, making themselves felt. Under front-wheel braking, even with the touring load but worse without it, the rear suspension extended abruptly – more rebound damping was needed. But these were about the only dynamic deficiencies. Over sharp bumps the ride comfort was extremely good. With the heavy load, tyre pressures needed to be high (otherwise tyre scrub, especially of the back tyre, occurred in really hard cornering), but the steering was good and there was none of the twitchiness that could characterise the Air 150 running similar loads. The next test was to ride the flat cycle paths and roads of the Gold Coast, pulling a trailer with my four year old son Alexander in it. I used a Chariot Cougar 1 child trailer; Alexander weighs 19kg. 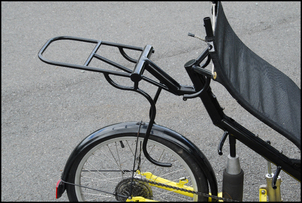 The trailer draw bar was attached to the rear wheel of the trike, not the suspended frame. In this form the trailer towed well, but at full speed, the direct connection of the draw-bar to the rear wheel could be felt to be steering the trike a little. That is, any yaw of the trailer was directly transferred to the rear wheel. The ~3kg downforce of the drawbar also effectively added to the unsprung mass, giving a poorer rear wheel ride, especially over short, sharp bumps. The trailer obviously needed to be connected to the main (suspended) frame, not the wheel. After this ride, the next day I had a slightly sore neck and shoulders – the seat was a bit too reclined for my best comfort. I revised the rear spring and damper mounts to position the seat in a more upright position. This also placed more of the mass between the front wheels. I refilled the damper with more viscous oil. I then went testing. Both because of the more forwards weight bias and the more upright seat (in which I felt more comfortable), I found I could throw the machine around quite phenomenally. I haven’t yet measured max lateral acceleration but it’s probably the highest of any recumbent trike I have ridden. In fact, to get it up on two wheels and hold it there I found quite difficult. However, by swerving dementedly back and forth I could throw it from being up on two wheels on one side, to two wheels on the other side, alternating back and forth, the suspension compressing hard each time a wheel came back to earth. This is obviously immensely hard on the structure of the trike – and something failed! 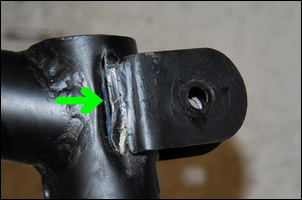 The rearwards mount for the front suspension – through which all the anti-roll forces are fed – started to tear away from the main tube. I’d thought that the long length of the brackets would spread the load sufficiently – but that was not the case. I then made a much stronger rear mount for the front suspension arm. I also made a new carrier that mounted the panniers lower – and then went testing again. This time I carried a load that comprised 37kg (and included some front-mounted water bottles) and again tested by swerving hard enough to lift a wheel. On this occasion I carried larger Arkel RT60 panniers. The trike felt really good. With the extra rearwards load, the rear brake could be used harder without locking the wheel, and the stiffer anti-roll behaviour (ie no frame flex at the attachment point) and lower-mounted weight reduced lurching with quick changes of direction. 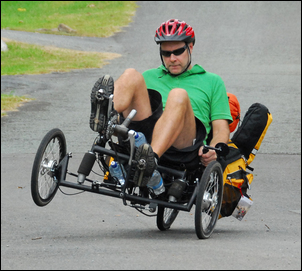 While the depicted two wheeling looks – especially in recumbent trike terms – pretty scary, the trike is actually very stable in this situation. Week 3 was particularly interesting! I rode the section from Oxenford to Logan - and found quite a lot of deficiencies in my machine. Firstly, and most seriously, the roll stiffness was insufficient. At speed, and especially with vigorous pedalling, the trike rolled from side to side. It also felt ‘tippy toed’, easily falling one way or the other from its vertical position, with the roll only then resisted. So there was both a lack of roll linearity, and roll stiffness that was simply too soft. Next, I thought the position of the handlebars was wrong for long distance touring. The front drum brakes were grabby, the rear mudguard rattled incessantly, the ride quality over coarse surfaces was clearly poorer than on my previous 20 inch design, and I thought the front suspension would probably benefit from external damping. On this ride, I’d give the trike maybe 7/10, tops. So why hadn’t I found these problems before? Simply, on this ride I was alone, it went for a relatively long time – and I got tired. And a tired rider spots things a fresh rider never even notices! I’ll get back to you further down the track when these issues - and any others that may arise – are solved. 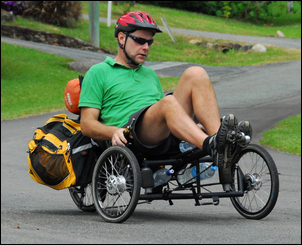 But for now, if you are interested in building a recumbent trike, Chalky has some excellent ideas that can be followed.